This article is a short summary of Mario vs. Donkey Kong: Mini-Land Mayhem!. 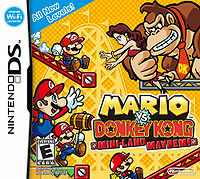 Boxart for Mario vs. Donkey Kong: Mini-Land Mayhem! Mario vs. Donkey Kong: Mini-Land Mayhem! is a video game made for the Nintendo DS. It is the fourth game in the Mario vs. Donkey Kong series that has been released. Mini-Land is having its grand opening, and the first 100 customers get a free Mini-Pauline. Donkey Kong cuts in line to get one, only to find out that he was the 101st customer. Angered, Donkey Kong kidnaps Pauline, and Mario uses the Minis to follow him through a number of attractions. He eventually defeats Donkey Kong at the "Final Ferris Wheel", but Donkey Kong kidnaps Pauline again. Mario follows him and defeats him at the Final Ferris Wheel yet again, but then makes up for Donkey Kong's remorse by bending the rules and giving him a Mini Pauline after all. Mario, Pauline, and Donkey Kong then ride the ferris wheel as the Toads celebrate the end of the conflict between Mario and Donkey Kong. Logo for Mario vs. Donkey Kong: Mini-Land Mayhem!